This is a permanent, professionally made sign, about two feet tall by three feet wide. It's made of metal and bolted to the wall. Because of the spelling you might assume it's for a hair salon with a sense of humor, but it's not. It's for a charitable organization around here that apparently permits trespassing during business hours. 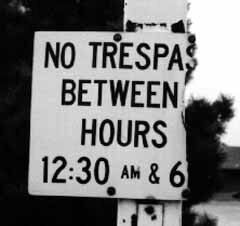 This sign, one neighborhood away from mine, also allows trespassing during certain hours. This sign, also one neighborhood away from mine but in a different direction, is a good example of the text-styling rule that says, "Just because you can do it doesn't mean you should." In the second sentence we have an unusual color for such an official announcement, and we have all caps in a serif font. But the first sentence uses not one but two colors, neither of which matches the last color. Furthermore, it contains both serif and sans-serif fonts. Furthermore, it uses both all-caps and normal caps. Furthermore, it uses both a large and a small size in the first two lines. Furthermore, it uses normal and bold-face in the second two lines. And the whole thing uses a colored background. 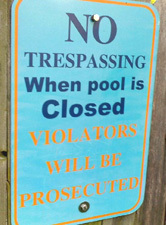 And, of course, it permits trespassing when the pool is open. Let's now discuss the subject of trespass, first with respect to crimes and second with respect to torts. 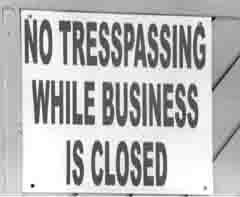 Trespass is a minor crime, at least relative to breaking and entering, in which a person is on premises where he is not authorized by the owner to be. If you are found on a construction site at night and have no business being there and you're caught by the cops and especially if the owner of that property wants to press charges then -- even if you otherwise committed no crime -- you can be found guilty of trespass and fined or jailed. With respect to civil law, a trespasser is one of three classes of person, the other two being invitees and business invitees. These three classes make a difference with respect to how much care a property owner must exercise to prevent injuries. It should be pointd out that it's not just the owners per se but anyone deemed to be in "care, custody and control" who may be sued, and hereafter I'll call them defendants. The question for each of the three classes of plaintiff is the degree of the "duty of care." Trespassers are owed the least duty of care, invitees are owed a middling amount, and business invitees are owed the highest duty of care. If you get hurt and allege in a civil lawsuit that the defendants owe you money to make you whole, you don't want to have to admit you were a trespasser, because the defendants owe you less care than if you were higher on the ladder. If you are deemed by a judge or jury to have been a mere trespasser when you were hurt, the defendants have to prove only that they provided a minimal degree of care for your safety. They have to warn you, usually done with signs, that it's dangerous to enter onto the premises, and often they erect fences, such as around a construction site. But if you're a trespasser and you fall into a pit and break both legs, a jury will likely find the defendants not guilty, because they owed you such a slight duty of care. 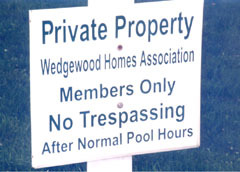 The next step up from trespasser is social invitee, because a social invitee is owed a higher duty of care than a trespasser. A social invitee is just what it sounds like, a person you invite (or merely allow) onto the property over which you have care, custody and control (but who does not rise to the level of a business invitee). If you're at your next-door neighbor's dinner party and you slip on a banana peel someone dropped an hour before and you break your hip, a jury will likely find your hosts not guilty, because they don't owe you that high a degree of care. If you're a business invitee you are owed the highest duty of care. with respect to civil law is different. This sign states the exact hours during which trespassing is permitted. Or it did till someone, no doubt a tresspasser, smacked it in half. The next Fun Pic is from the same shopping center.